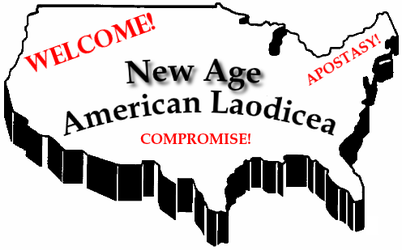 NEW AGE AMERICAN LAODICEA: Welcome! Come for the compromise, stay for the Apostasy! However, their lives proclaim that they they are not living in the last days. A few observations and thoughts about the New Age, its infiltration into the American Apostate Christian Church, Joel Osteen, apostasy, paradigm shifts and other New Age terms being used by pew-sitters and the dangers of compromise. This is a term which has burrowed itself into the American Church over the last 10-20 years, especially in the Purpose-Drive Apostasy of Rick Warren and his mentor, Peter F. Drucker. (VIDEO) Joel Osteen: A Shift is Coming – Creepy–and not just because it is delivered through the perpetual smile of one of America’s favorite Mainstreamers of Apostasy. WARNING: An ad for Osteen’s New Age Positive Affirmation CD “I Can” precedes the video. The infiltration of New Age ideas, techniques and practices USING CHRISTIAN TERMS and LABELING appears to be one of the biggest challenges to those who remain loyal to Jesus Christ. The original pioneer of bringing New Age positive affirmations into the Christian Church preceded Osteen by 40-50 years: Norman Vincent Peale. Maybe that’s one reason, though many in the churches bought his books, Peale was heavily promoted by the world and the Corporate Media. Peale was also most likely the first person–and certainly the most famous–to yoke Christianity with psychiatry. If 2 Corinthians 6;15 were taken seriously by the American Church, much New Age heresy–indeed, heresies in general–would be stopped in its tracks. Alas, professing Christians give any number of reasons to dismiss this verse while compromising with the very forces seeking the destruction of Christianity. Compromise is so insidious, it is not even noticed as such by some engaged in it. Others? They pretend not to notice compromise, even as they promote it at every turn. ONE EXAMPLE: This writer was asking questions on a forum a few months ago: about the supposed third Jewish temple, about Christ’s “once and for all sacrifice,” and about whether God would return to the Old Covenant during the Tribulation. A pastor replied that “parts of the Old Covenant would be in force during the Tribulation.” When asked where in the Bible it says that Jesus’ sacrifice will be overturned and the Old Covenant restored, the pastor asked “Where in my reply do you see all of that?” When pointed to his “parts of the Old Covenant would be in force” and asked what that could possibly mean, the man basically changed the subject. At best, the man never even realized what he was saying; at worst: he did. Either way, compromise is extremely deceptive and insidious. Believers were warned that, in the end times, apostasy would flourish among those with Christ on their lips. “When once the master of the house is risen up, and hath shut to the door, and ye begin to stand without, and to knock at the door, saying, Lord, Lord, open unto us; and he shall answer and say unto you, I know you not whence ye are: Then shall ye begin to say, We have eaten and drunk in thy presence, and thou hast taught in our streets. But he shall say, I tell you, I know you not whence ye are; depart from me, all ye workers of iniquity. Revelation recounts the church at Laodicea, which thought it was doing God’s work. The Laodiceans didn’t arrive at their infamous condition overnight. Since that church was not completely dead in Revelation 3, there surely were those along the way who tried to warn the Laodicean church. It wasn’t that the Laodicean Church was openly wicked–far from it. It was that this Church made so many compromises with the world, it was hard to distinguish it from the world. And the world is fallen, lost and wicked. Most likely, compromise wasn’t even recognized by the Laodiceans as such while it was occurring–which is why it took a warning from Jesus Himself to call it to their attention. History tells us that not even a warning from Jesus Himself could save the Laodicean church.The Muslim Turks captured Laodicea in 1119. The city itself was destroyed in the 13th century during the Turk and Mongol invasions. What will save the individual from apostasy? Paul has one answer. Apostasy is not coming. Apostasy is not imminent. Apostasy is here, in the New Age Laodicean Church of Joel Osteen’s America. And truly, what’s most tragic about the whole situation is that those dancing around appear completely unaware of the golden calf in the room.